A Companion to Chinese Archaeology is an unprecedented, new resource on the current state of archaeological research in one of the world's oldest civilizations. It presents a collection of readings from leading archaeologists in China and elsewhere that provide diverse interpretations about social and economic organization during the Neolithic period and early Bronze Age. 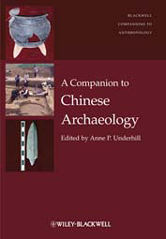 - An unprecedented collection of original contributions from international scholars and collaborative archaeological teams conducting research on the Chinese mainland and Taiwan - Makes available for the first time in English the work of leading archaeologists in China - Provides a comprehensive view of research in key geographic regions of China - Offers diverse methodological and theoretical approaches to understanding China's past, beginning with the era of established agricultural villages from c. 7000 B.C. through to the end of the Shang dynastic period in c. 1045 B.C.